As home renovation TV shows are all the rage, it’s no wonder many of us are encouraged to try our hand at simple — or sometimes complicated — household repairs. While it’s possible to be a successful do-it-yourself-er, certain tasks can be more hazardous than others. 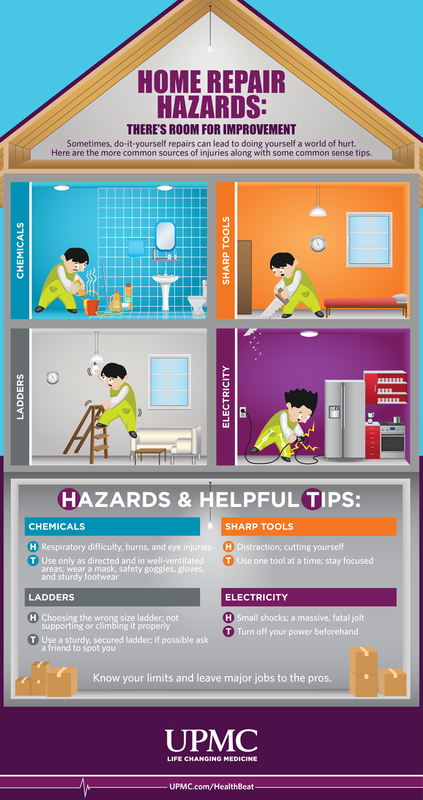 Here’s how to stay safe while working around the house. Your home should be your refuge from the stresses of the outside world — but it it can sometimes present its own dangers. These are the most common sources of home repair-related injury. According to the National Safety Council, 175,790 Americans were injured in 2013 on ladders, with injuries severe enough to require a trip to the hospital. Accidents tend to occur because people choose the wrong size ladder for a job, or because they don’t support or climb it properly. You could injure yourself while trying to repair a roof or ceiling, cleaning your gutters, painting high spots on your wall, or simply changing a light bulb. Electrical accidents are a frequent source of injuries around the house. Problems can range from a small electric shock to a massive, fatal jolt. While it’s possible to safely complete minor jobs yourself, most electrical work requires a trained professional. With these, the risks should be obvious: When you work with any sharp object, you run the chance of cutting yourself. Saws (manual and electric), power drills, and knives are common culprits. Whether you’re painting your home, refinishing your floors, or simply cleaning up, chemicals can be dangerous, leading to respiratory difficulty, burns and other skin concerns, and eye injuries. Find a UPMC Urgent Care location near you. There’s no reason why you can’t do some home improvement projects yourself. Be sure to take the following precautions — and know when to call an expert. Use a sturdy ladder and make sure it’s secure. Ask a friend to spot you while climbing it if possible. Use one tool at a time and stay focused on the task at hand. Distraction can lead to injuries. Only use chemicals in a well-ventilated area and use them only as directed. Wear proper safety garb, including eye protection (safety goggles), gloves, and sturdy footwear. Wear a mask when using chemicals. Be sure to turn your power off before performing electrical work. Know your limits. Leave major jobs involving electricity, gas lines, and roof work to the pros.